One of the main features of American news is its ability to demonize any enemy of choice, making them into grotesque characters with blood dripping off their fingers. It helps if they object of the demonization has a mustache. It also helps if the object of demonization says a thing or two that can be wildly misinterpreted, such as Mahmoud Ahmadinejad’s never-uttered desire to “wipe Israel off the map.” Syrian President Bashar Al-Assad has been most uncooperative in this regard. He’s a reasonable man who dresses in western attire and speaks in measured tone. Consequently, I doubt that an interview with Paris Match, transcribed and reprinted in English here, will get much traction here in the land of the free. The interviewer, Régis Le Sommier, is hostile and confrontational, repeating every item of Western propaganda as if it were factual. Assad parries with him, never loses his cool, and strikes a tone of utter resignation to the preservation of the State of Syria in the face of Western-sponsored terror emanating mostly from France and Turkey. Paris Match: Mr. President, three years into this war, and considering how things have turned out, do you regret that you haven’t managed things differently at the beginning, with the appearance of the first signs of the revolution in March 2011? Do you feel that you are responsible for what happened? Bashar el Assad: Even in the first days of the events, there were martyrs from the army and the police; so, since the first days of this crisis we have been facing terrorism. It is true that there were demonstrations, but they were not large in number. In such a case, there is no choice but to defend your people against terrorists. There’s no other choice. We cannot say that we regret fighting terrorism since the early days of this crisis. However, this doesn’t mean that there weren’t mistakes made in practice. There are always mistakes. Let’s be honest: had Qatar not paid money to those terrorists at that time, and had Turkey not supported them logistically, and had not the West supported them politically, things would have been different. If we in Syria had problems and mistakes before the crisis, which is normal, this doesn’t necessarily mean that the events had internal causes. This accusatory tone will appear throughout, with Le Sommier insisting that the Western-backed terrorist assault on Syria beginning shortly after the fall of Libya in 2011 is spontaneous and internal. Paris Match: Many people say that the solution lies in your departure. Do you believe that your departure is the solution? Bashar el Assad : The president of any state in the world takes office through constitutional measures and leaves office through constitutional measures as well. No President can be installed or deposed through chaos. The tangible evidence for this is the outcome of the French policy when they attacked Gaddafi. What was the result? Chaos ensued after Gaddafi’s departure. So, was his departure the solution? Have things improved, and has Libya become a democracy? The state is like a ship; and when there is a storm, the captain doesn’t run away and leave his ship to sink. If passengers on that ship decided to leave, the captain should be the last one to leave, not the first. Paris Match: Let’s talk about ISIS. Some people say that the Syrian regime encouraged the rise of Islamic extremists in order to divide the opposition. How do you respond to that? 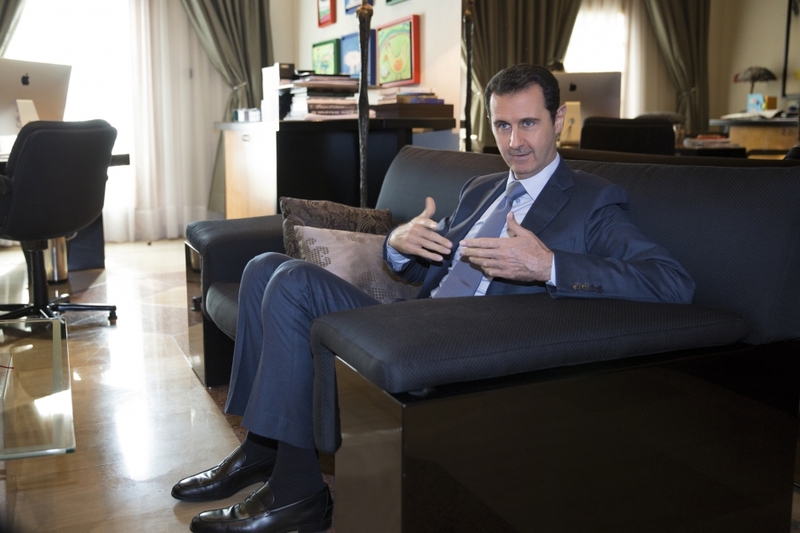 Bashar el Assad: In Syria we have a state, not a regime. Let’s agree on the terms first. Second, assuming that what you are saying is true, that we supported ISIS, this means that we have asked this organization to attack us, attack military airports, kill hundreds of soldiers, and occupy cities and villages. Where is the logic in that? What do we gain from it? Dividing and weakening the opposition, as you are saying? We do not need to undermine those elements of the opposition. The West itself is saying that it was a fake opposition. This is what Obama himself said. So, this supposition is wrong, but what is the truth? The truth is that ISIS was created in Iraq in 2006. It was the United States which occupied Iraq, not Syria. Abu Bakr al-Baghdadi was in American prisons, not in Syrian prisons. So, who created ISIS, Syria or the United States? In American propaganda, any government we want overthrown, no matter how popular or democratic, becomes a “regime.” Any leader, no matter how he comes to power, becomes a “strongman” or “dictator.” I was glad to see Assad correct Le Sommier on that matter. As to the origin of ISIS, it takes some thought and reading to understand that a full-fledged fighting force, armed and well-financed, is not birthed as an adult. Cui bono? Certainly not Syria. Paris Match: But U.S. Secretary of State John Kerry accuses you of violating the agreement because you used chlorine. Is that true? Bashar el Assad : You can find chlorine in any house in Syria. Everyone has chlorine, and any group can use it. But we haven’t used it because we have traditional weapons which are more effective than chlorine, and we do not need to use it. We are fighting terrorists, and using traditional weapons without concealing that or being shy about it. So, we don’t need chlorine. These accusations do not surprise us; for when did the Americans say anything true about the crisis in Syria? Indeed. When have the Americans said anything true about anything? It is a powerful interview and won’t be widely disseminated here in the land of the free. It won’t be featured on Fox or NPR or NY Times, our entire spectrum, far right to less-far right. It won’t fall into the lap of the average American news consumer. All will be shielded. So I urge you to read the whole thing, make your own judgments. Takes about ten minutes. That is indeed a great piece – I urge everyone to give it a look. As I was reading, the word “Tet, Tet, Tet” kept going through my mind. There was never any fracture in media support for the war in Vietnam until Tet, and, according to Chomsky, media criticism thereafter only came about because there was a fracture among the elite about pursuing the war. The media, which is in no sense free, was at least freed to represent the views of more than one group of elite. So it’s not that vanden Heuval and Kissinger are having doubts, but rather that the doubts were expressed in a mainstream state-controlled organ, the Washington Post and in Foreign Affairs as well. That can only mean what Tet meant – a time to rethink due to a military defeat. So I would look at Ukraine right now and see if it does indeed spell defeat for NATO and the US, but I repeat myself. US is retrenching, and people who have no compunctions about seeing hundreds of thousands die, are weighing the costs again – to the US. There is at least a possibility that a split among elite is too little too late to change the current course. Russia and China have made moves that are not easily undone. The EU will likely suffer big time from its slavish allegiance to U.S. neocons and NATO. The boomerang will land in Washington eventually. This is a really big deal in a whole lot of ways. Barely reported here. I did find a Forbes and WSJ article on it, but Saker if far more in depth with much more background and analysis. I wonder if the CFR article, Kissinger interview and the WP articles are related in some way. which is an off shoot by the people who launched democratic underground except everyone is welcome lefties righties, even republicans and fascists apparently. I thought you might find it interesting. They have a “jury format” where people who are too over the top obnoxious get their offending posts pulled, or not, depending on the random jury vote. A poster named Clarity of Signal posted the Saker piece there. If you go there my handle is john q citizen. Look me up! Thanks for the link. I’ll put it up on the sideboard here if my memory functions at all today. Your four links do not make a valid point regarding this piece, but do indicate that you think NPR is an authority source on the matter of Syrian’s fight of for survival. That’s your problem. You need to have a better view of American news coverage to understand that all outlets preach the same message, and NPR is performing its stenographer-to-power role in its reporting. Your shallowness is on display here. You obviously don’t read very much, have no historical perspective, and are logically challenged. NPR is more pathetic than MSNBC and FOX combined. I read continually from 0500 to 1700 every day and If you followed me on twitter you would soon realize you don’t know what you’re talking about. Your math is as good as your logic, I see. And anyway, I don’t believe you. Your blog demeanor and “writing,” which is mostly links, are not indicative of a person who is pensive and inquisitive. Mostly they are shallow, Googled, thoughtless and stupid. Suspect Mossad and IDF for Syria’s defensive posture. It’s not surprising that you would embrace a heartless autocrat like Assad, Toke: can we expect you to pen some eloquent primer on Kim Jong Un’s beneficence next? That you don’t question the motives of Paris Match and a French-speaking premier is childish, immature or inviolate hero-worship: laughable if not overt, suspicious hatred for Western Civilization. Western Civilization. Oxymoron, or getting damn close to it. Here’s my guess, Kurtz: You have read neither the original Paris Match interview nor this blog post as you link and comment away. You did manage three short paragraphs without links. That’s something, I guess.